Thanks, Mail Carrier | Great Gift Ideas with the Restaurant.com Holiday Gift Guide! 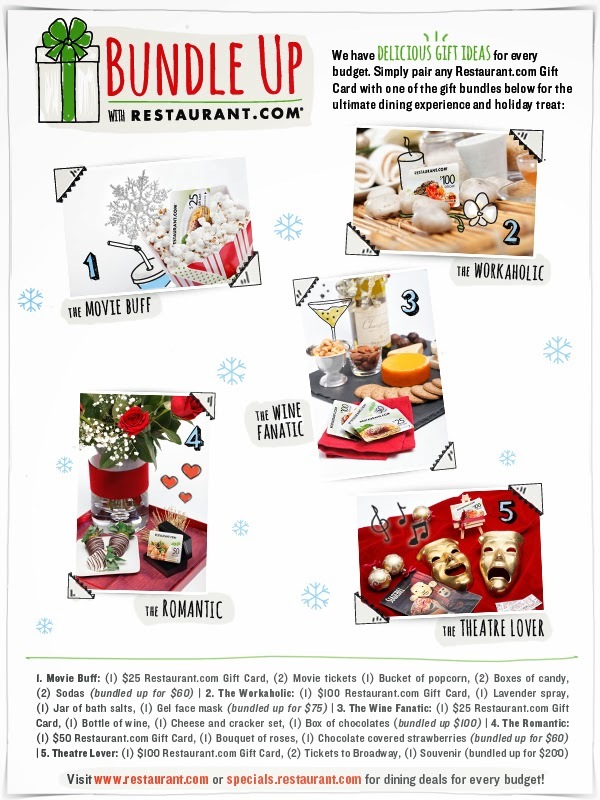 Great Gift Ideas with the Restaurant.com Holiday Gift Guide! With Hanukkah come and gone and Christmas right around the corner, I think it's safe to say that crunch time has arrived for gift-giving ideas. When it comes to finding just the right token of appreciation, gift ideas can range all across the spectrum in terms of creativity and budget. Big? Small? Specific? General? One sure winner? Giving friends and family (and teachers, hairdressers, mail carriers and more) time away from the kitchen by letting them dine out at their favorite restaurant. Who doesn't love when someone else does the cooking and cleaning for you? Which is why there is still time to head to Restaurant.com to not only pick up a gift certificate, but one that will provide a savings at more than 18,000 restaurants with more than 45,000 daily printable options. This year, rather than simply presenting folks with the gift card, why not do it in style? Restaurant.com has put together a creative and fun Holiday Gift Guide by handpicking delicious dining experiences and gift ideas for every budget and compiling them right for you. The Movie Buff: For the movie-quoting, obsessed friend, surprise them with two tickets to a movie on their must-see "Oscar" list and a $25 Restaurant.com Gift Card. Enjoy a night of appetizers and plot-dissecting debates! Ready to splurge? Stop at the concession stand for some candy, drinks, and a jumbo popcorn to share! The Workaholic: To help someone on your list find much needed tranquility, pair a $100 Restaurant.com Gift Card with soothing bath salts, lavender mist, and a face mask to create an affordable, at-home spa treatment. Ready to splurge? Add a spa gift card and make Dinner reservations for a nice, relaxing evening post-massage. The Wine Fanatic: Bring Napa Valley to every wine lover on your list! Pair their favorite wine with decadent cheeses, crackers, and of course chocolate. Then, cleanse their palate with some late night dessert and a $25 Restaurant.com Gift Card. Ready to splurge? Instead of dessert, make it dinner and BYOB at thousands of Restaurants nearby! The Romantic: Add some romance into your holiday with a $50 Restaurant.com Gift Card, bouquet of roses, some irresistible chocolate covered strawberries, and a candlelit dinner for two. Ready to splurge? Pick up some bubbly on the way home for a classy touch. The Theatre Lover: Add some dramatic flair to the holidays with two tickets to their must-see show and end the evening with our $100 Restaurant.com Gift Card - perfect for dinner and dessert. Ready to splurge? Buy them a memento from the show and two drinks during intermission! Be sure to check out Specials by Restaurant.com for even more shopping ideas and ways to come up with your own perfect bundle for those on your shopping list. While you're at it, why not enter to WIN one of these great gift guide bundles as well? 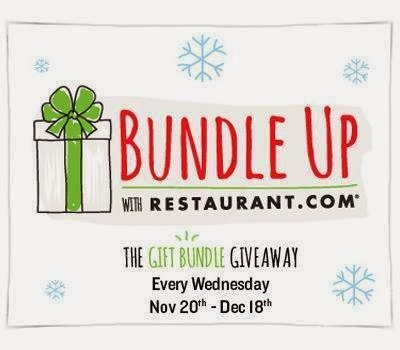 Just head to the Restaurant.com Facebook page between 12pm and 2pm CST every Wednesday through December 18, 2013. There you'll find a #GetBundled post with a trivia question — simply comment with your answer by 2pm CST and you'll be entered to win! (Find full rules and details here). Restaurant.com Gift Cards are available as e-gift cards for last-minute shoppers in all sorts of denominations, so you can take any of the above ideas (or your own!) and purchase the gift card that will best match your budget. 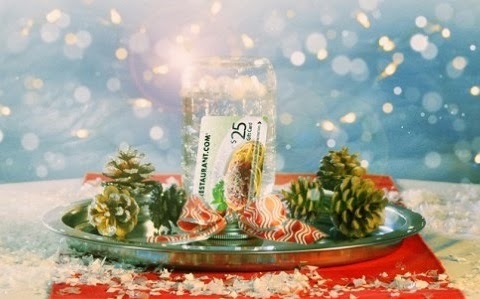 This holiday season, show your lucky recipients that you care while also being smart and saving money on dining deals at Restaurant.com. Be sure to visit their website to find out more about their gift cards as well as to find participating restaurants near you. You'll also want to connect with them on Facebook, Twitter Google+ and their blog so that you never miss their next great deal. As a member of the Restaurant.com Review Crew, I have been provided gift cards and compensation in order to facilitate my reviews and for sharing this information. However, all thoughts and opinions are honest and my own. This is a wonderful idea. I am going to purchase the Movie certificate for my daughter and son-in-law so they can have a nice night out and I will offer to babysit. I am going to have to check out this site. I had heard briefly about Restaurants.com, but haven't given them much thought...but love the idea of saving money! The Restaurant.com Gift Guide is great, it will help you to get gifts for everyone on your list. Thank you for this review. I'd love to purchase a gift card for my grandson's preschool teacher to show her appreciation for all that she does! Great idea! This is actually a pretty good idea--pairing a restaurant.com gift card with other things to create a theme. Thanks. I might look into this for my sister and brother-in-law. I've had a restaurant.com gift card and it was a nice treat to enjoy a meal with friends! I think bundling up the gift cards with extra themed-gifts is a great idea! It will cover all the necessities to make the restaurant outing even more special!